The Syracuse Orange and Georgetown Hoyas have a long-standing tradition of battling on the basketball court. They are now joining the same team to combat hunger in their local communities. “Can It! Rivals on the Court: Teammates in the Fight Against Hunger,” is a University-wide interfaith initiative that will kick off on both campuses in February to collect canned food and monetary donations for local food banks. The initiative is part of the Better Together: President’s Interfaith and Community Service Challenge in which both universities are participating. Donations for the Food Bank of Central New York will be collected at the Syracuse vs. Georgetown men’s basketball game in the Carrier Dome on Wednesday, Feb. 8, at 7 p.m. Fans attending the gamed are encouraged to bring donations of canned goods, which may be deposited in collection receptacles at the gates upon entry. Monetary donations may also be made. SU students may also donate canned goods in the Hildegarde and J. Myer Schine Student Center Wednesday, Feb. 1, through Friday, Feb. 3, and Monday, Feb. 6 through Wednesday, Feb. 8, from 10 a.m.-4 p.m. Collection receptacles will be available in the Schine Atrium. Students who donate three or more cans will receive a free T-shirt. Canned goods will be available for purchase in the SU Bookstore. “Syracuse University is proud to partner with Georgetown University in this exciting new initiative,” says Tiffany Steinwert, dean of Hendricks Chapel. “While campuses all across the country are engaged in their own individual Better Together campaigns for the President’s Interfaith and Community Service Challenge, our campuses decided to join forces. We wanted to embody the slogan “Better Together” by coming together, despite rivalries, for the common good. Georgetown will also sponsor canned food donation drives and drop-off sites on its campus in the coming weeks, and will raise awareness about the issue of hunger through various events, including its Martin Luther King Jr. Day of Service on Jan. 21. For more information on the Can It! 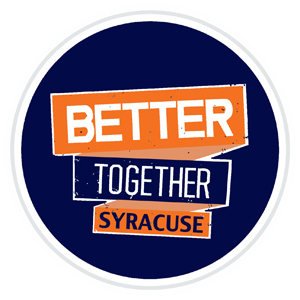 Food drive or Better Together initiatives on the SU campus, contact campus coordinator Syeisha Byrd at 443-1254 or smbyrd@syr.edu or visit the Better Together Syracuse Facebook page .